Thanks to our quality workmanship, competitive pricing, and 50 years of combined experience in the industry, you can’t go wrong working with our roofers in Bradford. 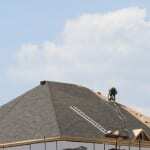 At Slippery Slope Roofing, we believe roofers should be timely, friendly, reliable, and detail-oriented. These are all qualities the roofers on our team embody, and we know that when you need someone to work on your roof in Bradford, Ontario, you’ll be more than happy teaming up with us. What really gives our roofers a competitive edge is the fact that we only work on one roofing job at a time. This allows us to really focus on your roof and complete the repair or replacement in a timely manner. Since we won’t ever have to rush off to another job, you can feel confident knowing we’re giving your home’s roof the attention it needs and deserves. While we work on your roof, our roofers will keep the surrounding site clean and remove any excess debris and materials as soon as possible. Not only can a cluttered job site be a safety hazard, but it can also keep you from being able to live in your home like normal as we work on your roof. Our goal is to make the repair or replacement process a breeze, and keeping our work area clean is just one of the main ways in which we accomplish this. Thanks to our quality workmanship, competitive pricing, and 50 years of combined experience in the industry, you can’t go wrong working with our roofers. Reach out to us at Slippery Slope Roofing today to schedule a consultation or to find out more about our services. At Slippery Slope Roofing, our roofers proudly serve Bradford, Barrie, Orillia, Alliston, Newmarket, Midhurst, Cookstown, Beeton, Innisfil, Angus, Collingwood, Wasaga Beach, Oro-Medonte, Midland, New Tecumseth, Clearview, Bradford, Essa, Stayner, Springwater, and surrounding areas of Ontario.